Some more fabulous artwork features on the UK quad for 70s thriller. Starring Michael Caine, Anthony Quinn and James Mason. Writing on back no bleed through, light wear and little paper-loss to left hand margin, and cross folds. 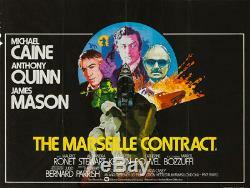 The item "Original The Marseille Contract, UK Quad, Film/Movie Poster 1974, Michael Caine" is in sale since Thursday, April 12, 2018. This item is in the category "DVDs, Films & TV\Film Memorabilia\Posters\Originals - UK Quads\1970s". The seller is "orsonandwelles" and is located in Bath.